Some people prefer doctors’ of their own gender for a variety of reasons, but one common reason is that ‘they can relate to the problem’. To which, I’ve heard the argument (and read online) that if you want to use the argument that you want a doctor that has been through what you have, then be sure to get the orthopedic surgeon with a broken hip, the neurologist with a stroke, and the cardiologist with a heart attack. Is that a fair argument/assessment? In most cases, I would say, that I don’t care what gender the doctor is… I just want the one that’s most qualified! But of course, there are instances that you would rather just have the doctor be the same gender as you (especially for females) for your own comfort level in certain situations. Others, however, argue that that is reverse sexism. I’ve read so many articles lately about how male resident doctors have had such a hard time because they have a double negative against them. A) They are resident doctors and some people don’t want ‘students’ treating them (even though they must run all cases by whoever they are working under) and B) a lot of females want to be treated by females for certain things. I don’t know if that is a fair assessment though and wonder if males prefer male doctors for certain things. On the other hand, I see (and have heard/read) the other side of the argument — that a doctor is a doctor, so their gender shouldn’t matter and should be taken out of the element… and that doctors of both genders have gone through extensive education and whatnot. I don’t think it’s that simple though — of course there is a human element to it that can’t be taken out the equation so easily. I certainly don’t think all doctors are equal — but I also don’t think a doctor of a certain gender is better than another. After reading such articles, I’m so torn! I see the argument from both sides of the argument so well. I guess it’s one of those things that is ‘to each, his own’. What do you think? I’ve got another brain teaser for you! There are six glasses. 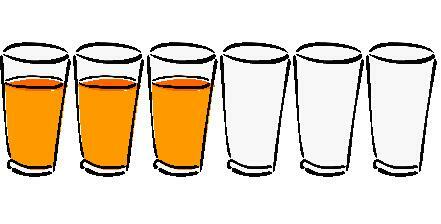 The first three of the glasses are filled with orange juice; the other three are empty. By moving only one glass, can you arrange them so the full and empty glasses alternate? I’ve included an image for those of you who need a visual image! Yesterday (11.08.11), on Election Day, I became a U.S. citizen! For a political buff like me, that is pretty neat. I may be the only person excited about jury duty, and of course I can’t wait to vote! We’ve always sent an absentee ballot back to Canada to vote. Apparently, the NJ office is one of only three in the country where you can have your interview and oath on the same day… which meant it was a LONG day! I left home at 8 AM and didn’t get back until 5 PM. The interview portion of the day lasted probably less than five minutes (and this includes all the form signing), so it’s just the logistics of it that makes the wait so long. Before they quiz you on the U.S. history/government, they have you read and write a sentence in English. I had to read the sentence “Where does the President live?” and write “The President lives in the White House”. Who is the Governor of your state? Last year on Election Day, I got the iPhone 4. This year, I became a citizen. I wonder what will happen next year! Someone I know had this as their Facebook status yesterday, and it made me literally laugh out loud. Because it’s so true! Whenever I am filling out an application, and I get to the part where it asks “who should we contact in case of an emergency”, I always write in “doctor”. What’s my mother/father going to do? It’s made me laugh a few times today, that’s for sure! 75% of people cannot find the the mistake in this 1 2 3 4 5 6 7 8 9 10 11 12 13 14 15. So I am waiting in the lobby of the hospital earlier this morning, and this adorable little girl (had to be 2 1/2 or three years old at max) caught my eye. She was giving her mom a hard time and running around in a crowded area (every young mother’s nightmare, I’m sure). To try and calm the kid down, the mom offered her daughter a snack — little cookies. The child happily obliged, and was enjoying said cookie… until she dropped it on the ground. She looks down at the cookie, looks up at her mom, then quickly picks up the aforementioned cookie from the dirty floor and stuffs it in her MOUTH thinking the mom hadn’t noticed! The mom, of course, did notice. She tries to convince her daughter to spit the cookie out.. and after a few seconds or so — the daughter says: I’ll throw it in the garbage myself. The mom agrees. The little girl spits the cookie into her hand, runs towards the garbage can, turns around and quickly puts it back in her mouth and swallows it! Everybody in the room who had noticed the incident play out (except for the mom of course) burst out laughing. I feel for her parents already. That kid is going to be rebellious in her teen years for sure.